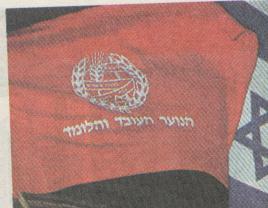 The Labour (One Israel) Party flags show their logo [instead of the Magen David] on the national flag. This is not an official flag and has no specifications, but it is hoisted in front of the party headquarters in Tel-Aviv. The size of the emblem could differ from one production series to another. I guess it depends in who the manufacturer is. The Labour party used to use the red colour. However, it uses now also only the national colours (blue-white), sometimes with the emblem with lighter shade of blue. This week there was the "official" begining of 2003 elections campeign. (Elections due to 28 January). I am watching the TV promotions just to see if any flags are used. I saw the flag of the Labour party - red logo and blue inscription on the central white stripe of "national" background, same as previously reported. Remarks: Appeared as Israel Akhat (= One Israel) on 2000 elections. 1) MAPAI - Mifleget Po'aly Eretz Yisrael (Israel Land Worker Party) that was founded in 1930 by unification of HaPoel HaTza'ir (The Young Worker - founded 1905) and Akhdut HaAvoda (Labour Unity - founded 1919) and since its foundation was the ruling party, first in the Zionist organizations and later in Israel. Its leaders, David Ben Gurion, Moshe Sharet and Levi Eshkol were the first three prime ministers of Israel, the last one initiated the foundation of the labor party. 3) RAFI - Reshimat Po'alei Yisrael (Israel Workers List)  Split from MAPAI in 1965 and led by David Ben Gurion. The labor party was the ruling party until 1977 and since then the government shifted hands few times. Golda Meir, Yitzhak Rabin, Shimon Peres and Ehud Baraq were PM's from the labor party. The party took a blow in 2003 election getting only 19 seats. Some key figures from this party such as former PM Shimon Peres joined Kadima. The party got 19 seats also in the 2006 election. Considering the fact that some key members retired and joined Kadima and that the party was led by a "new" face, it is considered as a good result. The party joined the coalition with Amir Peretz as Minister of Defense. Ha'Avoda logo is the party name beside an ear. Using it between two blue stripes as the national flag, make it the party flag. I believe both flags are used. Better made flags (in use at the party headquarters etc.) show the red emblem. Those for common use (plastic flags etc.) have an all-blue emblem, probably to save costs. Scanned from today's Yediot Akhronot newspaper, as seen in a youth demonstration in Jerusalem, the flag of the youth movement Ha'Noar Ha'Oved ve-Ha'Lomed. It is one of the biggest youth movements in Israel and it has, as can be understood from its flag, a socialist background. Even though not officially connected, it can be regarded as the Labour Party youth movement. Here is a photo of the flag from <www.noal.co.il>, reported by Inbar Gutterman. The flag is red and charged with the emblem of the movement. Emblem at at <www.minimom.co.il>. The insciption on the scroll is the movement motto: "La'Avoda, Le'Hagana Ve'La'Shalom Ale Ve'Hagshem" (= For labour, defense and peace - Rise and fullfil). Branches (a.k.a. Ken, p. Kinim = nest(s)) use the same flag with inscription of the branch name. At the Israeli National Photo Collection there is a photo of "A MAY DAY DEMONSTRATION IN RAMLE 01/05/1949". 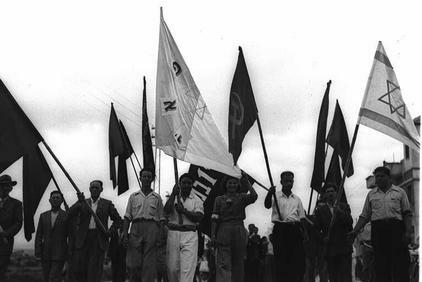 Note the flag in front - it is probably the flag of MAPAI (Mifleget Poalei Eretz Yisrael - Israel Land Workers Party) - the predecessors of the labour party. Meymad - Medina Yehudit Medina Democratit" (Meymad [Dimension]  Jewish State - Democratic State), was founded in 1988 as a Zionist religious party and as a counter-weight to the right wing religious and the ultra-orthodox parties and since 1999 ran together with the labor party. Web site at <www.meimad.org.il>.